From southern Africa, Eucomis are a very easy care bulb with over 15 species identified however only a few varieties commonly offered for sale. Commonly called the Pineapple Lily, they are mainly grown for the interesting flowers with a pineapple like topknot, some such as E. vandermeweri also have attractive foliage. They are easy to grow, as long as they receive some moisture during summer and are in a sunny position in a well drained soil. The flowers are large for the size of the plant and consist of a bract of small star shaped inflorescences. The real beauty of the Eucomis is the long lasting flowers which appear from late summer into autumn. They work well as cut flowers and florists use them widely. Although they are said to require a dryish winter, we find it is drainage that is more important. These are a plant that do not like frosts, so choose and appropriate position or grow them in containers. Soil needs to be well drained, and the amount of sun they receive will depend on the climate. The warmer the climate, the more shade. However these are a versatile bulb and cope well in much damper and cooler climates than the natural habitat. Ideally a sunny position in a well drained humus rich soil, however Eucomis do seem to cope with a little neglect. In a sunny position the foliage seems to stay more upright and the flowering is stronger than in shaded areas. Plants can be left to dry out during winter and watering and fertiliser can be applied in spring as growth commences. Eucomis grow well in pots or containers particularly in areas where frosts are a problem and they can be more easily given protection. They make a wonderful plant for a ‘tropical look’ in cooler climates. These are a clump forming bulb and are easy to propagate by division of established clumps during dormancy. Propagation is also possible from seed sown in late winter to spring. Eucomis comosa ‘Sparkling-Burgundy’ (pictured right) is a wonderful pink flowering cultivar with green foliage with red margins and a red stem. Eucomis zambesiaca will reach around .3m and has pure white flowers tinged with green in bud. Lovely green foliage and lower growing than some others. 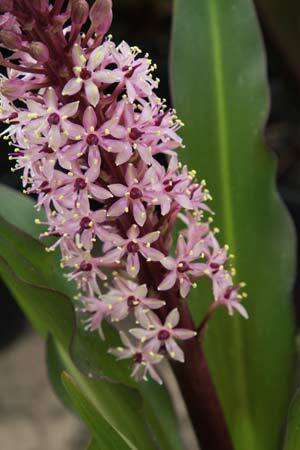 Eucomis bicolor with its pink and white flowers is another. RORAIMA NURSERY 20 Swan Street, Lara, Vic. 3212 Contact: Ph/Fax: (03) 5282 8704 Mail Order and Retail Nursery Cacti and succulents. Wide range of trees, palms, ferns, shrubs & perennials.